GRANITE - a unique natural material. Elegant and solid, expressive and various, massive and eternal ‰ best material for an inhabitancy of person. nature has created his(its) so unique and various, that each product from him(it) is unique. granite has high stability to friction, compression and pollution. It is most suitable material for areas with high passableness, and also for external furnish of buildings. Besides of a granite make table-tops, ladders, bar racks etc. Most widely used in construction and monumental architecture a natural stone. A stone with uniform granular structure, basic color background of a granite " pink, yellow, red and grey. 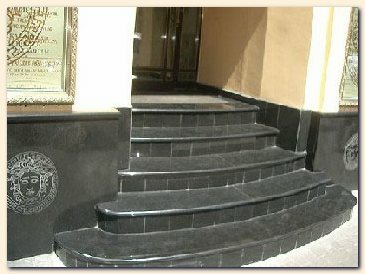 Due to high durability and decorative qualities, granite finds wide application as a material for manufacturing ladder steps, blocks for monuments and sculptures, a facing material, flooring, onboard and òðàòóàðíûõ plates, kitchen table-tops in furniture industry and so forth.